The WIN Network was created to teach everyday people to start or take a business online by branding themselves. 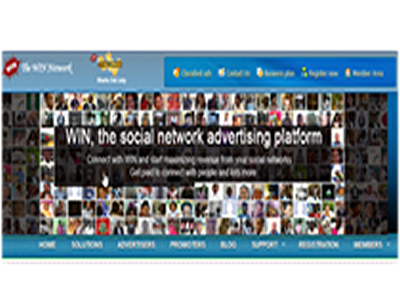 Its a social advertising platform where you can ether advertise your business or promote other peoples businesses and make money and so much more to love in the platform. The reason I put somewhat in brackets though is because putting the WIN Network in words just isn’t possible. It would be like describing color to someone who was born blind. You have to experience it to truly appreciate it. With that said let’s get into what makes the WIN Network… the WIN network. It’s products! The various products WIN has to offer is split up into the following membership. With a free membership on the WIN network, you can only advertise your business and services or refer new individuals to get a commission. So lets say the free membership is meant for only advertisers. I say this because even if you refer new individuals and get commissions, you will not be able to withdraw them... not util you upgrade your membership. So with this its better to just subscribe for a VIP membership on start. With a VIP membership subscription, anything is possible on the WINThrills Network. WIN charges a little fee of N2600 membership for the whole of the year which is should be affordable for anyone. You only pay NGN2600 a year for the VIP membership. They consider it as an little investment to fully put you into the network. They believe that people who do not pay or invest often do not take things seriously. I totally agree to that. Besides the income you are going to make subsequently will be way more than the membership fee. Ive been on the WIN platform for about 2 years now, ive paid two VIP membership fees (N5,100) and I earned more than NGN600,000 (mostly from the WIN challenges) on the WIN network. So did i gain or did i loose?. So with this, the membership fee should be nothing if you are willing to make money on WIN. Ill explain on a later post the technique how i make my six figure income with WIN. So what does WIN offer their VIP members. Lets glance through what they offer. Winthrills.com offers any VIP member with a social network account (Facebook, Twitter, Google) the opportunity to earn additional income by simply incorporating a selection of text and clickable link on their social network pages. Fast and Flexible Payments: Get payments every 8 days with only a N3000 minimum payout. You can choose to get paid directly to your bank account. Maximize Your Traffic Monetization: Place our ads on your social network updates. You can even increase your cost per click depending on your traffic generated and consistency on ads promotion. We will always ensure that you are making the money that you deserve. Quality Support: Dedicated account managers and WIN staffs will be available for consultation upon account creation. Get full support by phone, email, and even through live support. Earn Extra with the Referral Program: With A VIP membership plan, you can earn₦1000 additional income every time you refer a VIP member or Advertiser to WINs network. Earning has never been easier. Get A Steady Income From The Company: VIP members can complete a referral challenge and get placed on a steady income with the company. See Challenge tasks. With the above gotten from the WIN website, you can see that there are alot of opportunities to grab from it. If you are good at marketing, then you can partake in the WIN challenge or make referrals and get huge commissions. if you are a social network guru or you have alot of fans on your fan page, then the promotion of ads can make you alot f cash. If, after looking around this site and especially after checking out all of the resources I linked to, you feel like the WIN Network is the right vehicle to upgrade YOUR life too, click here to partnering with me on the WIN network. Did we mention we will be hooking you up with some totally rad bonuses as well? Oh yes! Clickity click the link above to kill your curiosity.